It’s been nearly a year since Buffalo Trace’s last release in the Colonel E.H. Taylor line, and now the eighth of these whiskeys is here, and it’s got quite a story behind it. First, it’s critical to note that this is a wheated bourbon, while the others are all rye-focused bourbons, except for one straight rye. 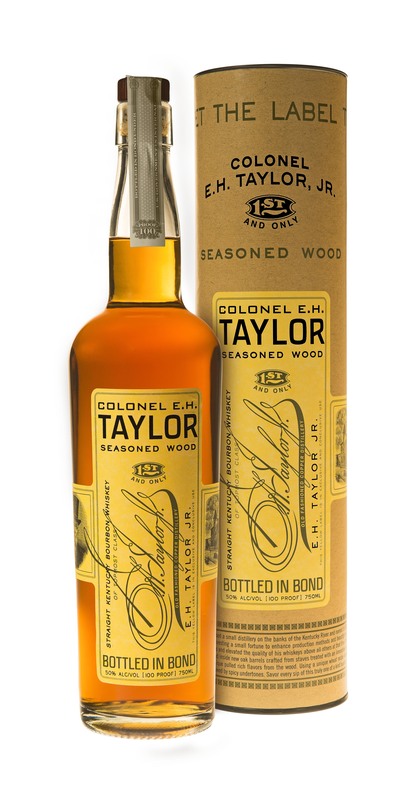 Discussion is already heated up about how a single line of whiskeys can have so much variety; Chuck Cowdery has an excellent post wondering whether this should have just been an “Experimental Collection” release or whether the higher prices commanded by the E.H. Taylor label had something to do with it. Hey, I don’t judge. The barrels in this release underwent a variety of special seasoning processes, including barrels made from staves that were immersed in an enzyme rich bath with water heated to 100 degrees. After spending time in this proprietary solution, these staves were then placed into kilns and dried until they reached an ideal humidity level for crafting into barrels. Other staves were seasoned outdoors for six months, and still others were left outdoors for a full 12 months before being made into barrels and sent to Buffalo Trace Distillery to be filled and aged. All barrel staves were seasoned, dried, and crafted at Independent Stave Company, who consulted on this project with the premiere expert on oak maturation, Dr. James Swan. The whiskey is aged for “well over a decade,” but carries no formal age statement. Whether it’s enzymes or whatever, what BT has put into the bottle here is outstanding. The nose is loaded with maple syrup, light cinnamon, cayenne pepper, ginger, and ample wood-influenced vanilla and caramel notes. On the palate, the initially intense sweetness is backed up by an explosion of flavor: Sweet vanilla backed up by black pepper, salted caramel, some barrel char, and a touch of herbal character on the finish. At 50% abv, it drinks a touch hot, but everything’s fully manageable as it warms the body late in the game. Over time, notes of gentle citrus fold into the maple syrup notes, giving it an orange marmalade character. Highly drinkable yet also unique and complex, it’s a fantastic little whiskey. Doesn’t remind me at all of other E.H. Taylor releases, but that’s a story for another day. Bottle presentation : 10/10, absolutely beautiful. Nose : Birch wood, nice smoked barrel char, Belgian dark caramel, warm milk chocolate mixed with fresh honey, peppermint bark shavings, bamboo, fudge and toffee melted together. Mouthfeel : Canadian maple syrup, honey, caramel, some rum like mouthfeel, salted caramel brulee, custard & thick salt water honey flavored toffee. Feels very rich and pure. Value : I would feel comfortable paying $180-$220 but after that it is up to one’s personal judgement. Compared to PVW : It is right up there, neck to neck as far as taste goes. I think my ranking goes PVW23 > CEHT SW > Micther’s 25 > PVW 20 if I had to rate all my favorite every day pours. But it is very close with PVW23. Fun fact : It comes with a tax stamp on the bottle. CEHT is the only Pappy Van Winkle product that has tax stamps still utilized on their bottles which date back to the 80’s. Availability : It will be released to you common peasants soon, wait for your turn. This is a great addition to the E.H. Taylor Line! I really enjoyed last year’s Cured Oak and have been wanting to try this. Unfortunately, every place I know that is getting cases has them “already spoken for” or want north of $500/bottle. Frustrating really, but with a limited release I guess it is expected. I found a bottle last month on a small stores shelf for 69.99, but wasn’t sure so I passed. After reading this review, I called the store and had them set it aside for me, picking it up next week.